Considered one of the most beautiful temples in the world - and the veritable heart of the Sikh religion - it's no wonder that tourists come from all over the globe to see the Golden Temple of Amritsar. Situated in the middle of a sacred lake fed by an underground spring, the golden structure is a unique blend of Hindu and Muslim architectural styles. Within the temple is the Adi Grantha, the sacred scripture of the Sikhs, displayed on a jewel-studded platform. Visitors to the Golden Temple can enjoy the serene and spiritual atmosphere, with the sound of Sikh hymns accompanied by flutes, drums and stringed instruments. Next to the lake are the enormous pilgrims' dormitories; and at the gate is the information desk, where helpful and friendly staff will answer your questions and provide free pamphlets on the temple and Sikh religion. 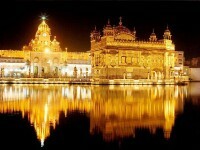 Visitors to the Golden Temple should be respectful of the Sikh culture. Smoking and alcohol is forbidden throughout the complex, and visitors must remove their shoes. Heads must be covered at all times - for those who forget, vendors will sell bandanas near the temple. Alternatively, it is possible to borrow a head covering from the pile kept at the entrance.